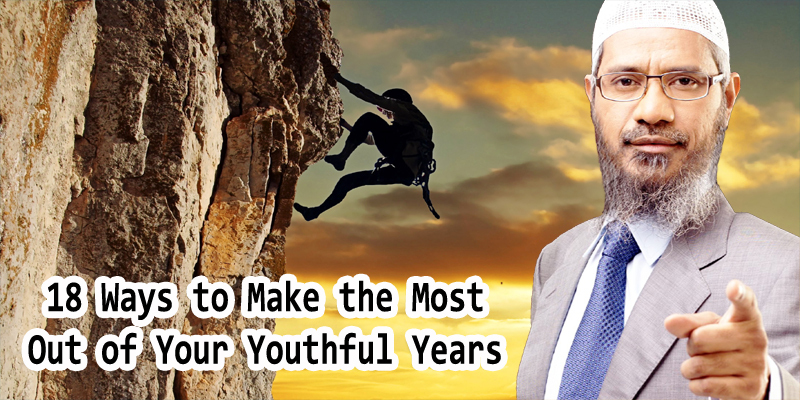 As you know, youthfulness is a great power that is full of vigor and activity. If we do not use it in a constructive way, it will explode to destroy what others have constructed of advantageous establishments. Most of us live idly and sleep more than required. We go out of our homes just to waste time in trivial things or boyish adventures. How can we use this great power in a manner that will please Allah and will benefit people, our society, and ourselves? When a driver loses control of his car, he throws himself and others into a bloody disaster. Do you know what prevents him from this disaster? They are his knowledge of the art of driving and his will. Two things: one is knowledge and the other is will. The same can be said about a young man who puts himself in a situation without knowledge or will. He will involve himself in a disaster the end of which is failure and fruitlessness. The youth have to seek out knowledge and sciences that will benefit them. They should not throw themselves into the laps of bad people from this material life because then they would become slaves in the circle of untruth. Imam as-Sadiq (a.s.) says,‘I do not like (to see) a young man from you unless he is in one of two sates: either a teacher or a learner.’ The youth should seize opportunities to learn means of developing their powers in order to establish the first bases of future success. Who are the failed people in life but those who did not learn during their youth? Then, what is the required knowledge? If the youth learn the beliefs of Islam, legal laws, and morals, and reach the degree of piety in their faith, they will never pant after the material life or fight for its transient pleasures. They will never feel sorry if they miss one of its pleasures. They will never make troubles for this and that. They will never think of destruction or violence as a solution if fate deprives them of a blessing or prevents them from reaching it. 1. Know yourself well; promise yourself to be sincere in achieving happiness, and watch your fancy lest it troubles your sincerity. Nevertheless, you may fall into the trap of fancy, but in this case hasten to get out of it by repenting and asking Allah to forgive you. Then review the causes of your fall and be careful that they are not repeated. 2. Fill your mind with knowledge; let your first source be the Holy Qur’an, which has explained everything, and keep away from the Satan and his followers. 3. Be steadfast before difficulties and be patient in any case. 4. Open your heart to your high goal, for you have been created for Paradise. 5. Make your personality respectable and try to have positive effects on others. 6. Keep a thick curtain between you and material, reactionary, shallow, anarchic, selfish, and submissive ideas. 7. Organize your time, order your daily tasks, and write down your appointments in your pocket notebook. 8. Trust in your own abilities and talents and complete them by cooperating with the abilities and talents of others who are like you in belief. 9. Learn how to speak appropriately with people and have influence over them. 10. Carry out the needs of whoever may ask you for help, and do not remind him of your favor to him someday. 11. Be ascetic in life! Do not wish for what there is in other people’s hands of wealth and beauty. 12. Find a job that brings lawful livelihood. 13. Hate idleness and laziness because Allah hates them, especially for the youth. 14. Take care of your physical and psychological health and do not ignore your share of amusement. 15. Get married early and always advise the youth to do so. 16. Do not stop at a certain limit in your good ambition because the way towards Paradise is open before you. 17. Be calm and plan for your future while thinking of good deeds and good rewards. 18. Do not forget the remembrance of Allah, supplication, and the love of those who have showed us the way to deliverance who are the Prophet (S) and his progeny first, and second all those who have followed them.